Have you ever bought one skein of hand dyed yarn and fallen in love with it and then realised its a one off, never to be repeated colour, and the other few skeins out there have been knitted? This was the case for me with Posh Yarn Martha Sock in the Cha cha cha colourway. I only really bought it because of the name, I'm a big fan of Strictly Come Dancing and thought it would be fun to knit whilst I was watching the programme. The more I knit it the more I fell in love with it. Martha Sock is my favourite yarn base. I might briefly flirt with other yarn bases but eventually I always come back to Martha. The colour of Cha cha cha is just beautiful. Its purples with subtle hints of cerise. Its what I imagine you would get if you mashed blackcurrants up and used them to dye with. Other colourways have come close. I'm currently knitting with Martha Sock in Trumpet Voluntary which is purples with hints of blue and is also beautiful to look at. Still though, Cha cha cha is my favourite. 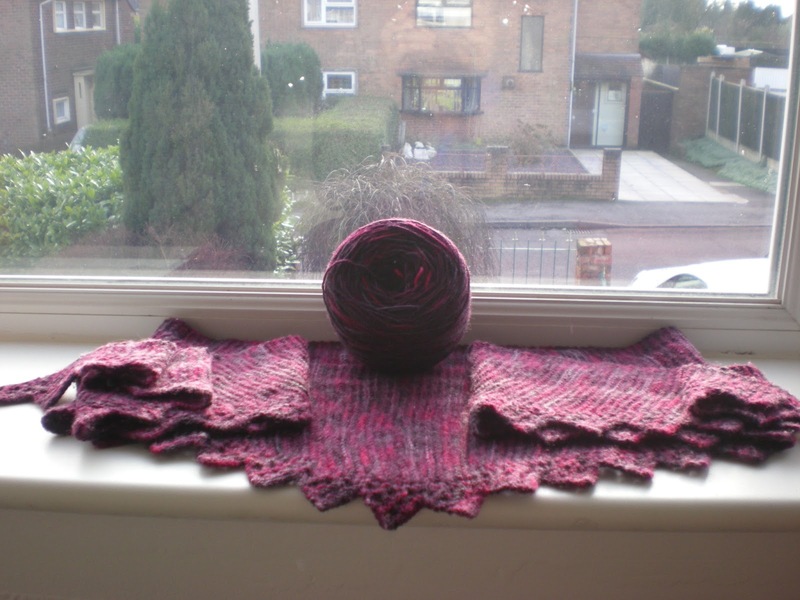 So you can imagine how happy I was when I saw on the Posh Knitters group on Ravelry that someone was destashing a skein which looked almost identical called Murder she wrote. Obviously I bought it, what else could I do? It really is so close in colour, its maybe a little darker but the same underlying colours are all there. So I've decided its going to become a pair of fingerless mitts to wear with my Cha cha cha shawl. I already know I am going to enjoy every single minute of knitting because I will love watching the colours change and blend under my fingers as I knit it.